My squat has some serious left-right imbalances and I don't know how to fix them. Half the time I'm holding the bar at an angle. Sometimes I just try to force the side that is too high down, but even when I do that, I look at the videos and my elbows clearly have different angles and different heights.... That being said, right and left muscle imbalances are not the only ones to consider. Remi Michalowski outlines a solid strategy for left and right side movement weaknesses, but it is only one of many. Even if muscle testing reveals a muscle imbalance, the pattern of movements that caused the problem still has to be corrected�retrained. Best way is to use a series of �chop� and �lift� exercises, which are fundamental right side/left side movement patterns and building blocks at the ground level of training. For a RIGHT rotated pelvis: you will need to strengthen the muscles that rotate the pelvis towards the LEFT (to get it to neutral from a Right rotated position) on both the LEFT and RIGHT hip. 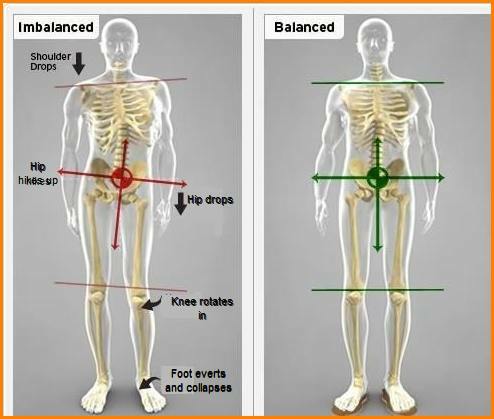 So � if you have a RIGHT rotated pelvis, follow ALL exercises as mentioned in the post.